We are settling into a summer routine and it's been really great. Monday Will Holden had his two year check up. He is a very healthy, active boy. He's 35 inches tall (65%) and 33 lbs (91%). We spent a lot of time playing outside. Hollis spends a lot of time talking. Like constantly! ha! Monday afternoon, I was driving to pick up Harper from gymnastics when Will Holden started saying "ow ow" and squeezing his nose. I stopped to look at it in the parking lot and he had stuck a huge plastic bead up his nose. Of course! I called Scott and told him I was going to have to go to an after hours clinic but he was headed home so he said to just wait. Thankfully Dr. Scott took tweezers and got it out. Life is never boring with this one. Will Holden had the first of many dates on Tuesday. ha! My friend Susan was keeping her grandkids and we went over to have lunch and play. The date didn't last long - he didn't like her holding his arm and she didn't like his driving. ha! We started swim team last week. We go every day but Fridays for six weeks. The girls are loving it and I'm excited it's going to help them be strong swimmers. We have been going to the gym every morning and then going to the pool. Thankfully Will Holden HATES the water so I don't worry about him trying to jump in. He runs around the pool area and I chase him while the girls swim. I look at it as a second workout. ha! Harper moved up a level at gymnastics this week. 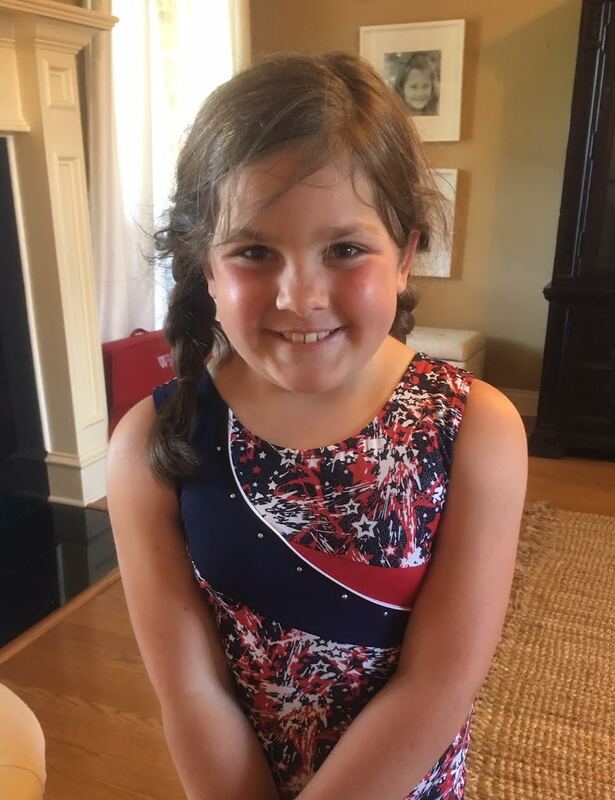 She is really loving gymnastics. Friday we had a play date with some friends. Will and R are in the same class at church and school. Friday night the girls and I modeled in a Fashion Show put on by our local Gap. It was a fundraiser for the local women's shelter. I felt so awkward going down the run way but I so enjoyed spending the night with my girls. We had a good time together. They are getting so grown up and I just love them more at each age! Saturday was Hollis' BFF's birthday and his request was to spend the day with Hollis. 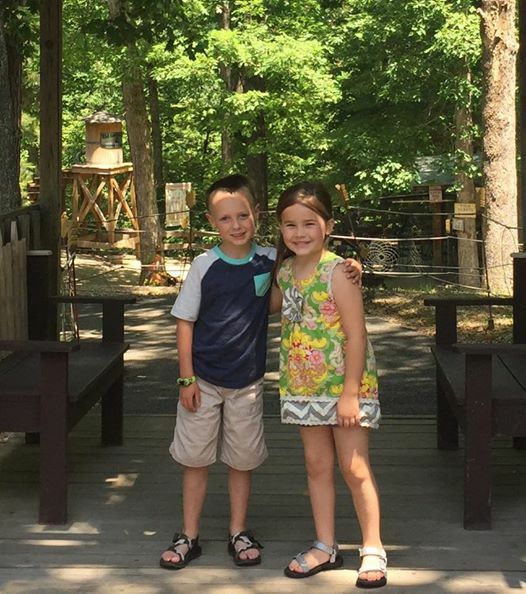 So his parents took this pair to lunch and a cave and to get ice cream. They had so much fun. They are so cute together. Scott worked n the yard all day and I hung out with Harper and Will Holden. 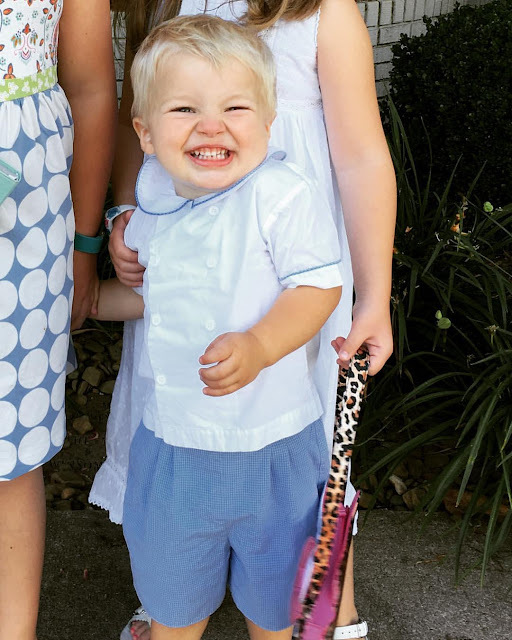 How cute is Will Holden cheesing before church this morning. He really DOES smile! This is his newest cheesy smile he does. He cracks me up. We went for a long family walk tonight. Hollis needed to sit and rest at one point. ha! I'm loving our summer - it's going by FAST!